1. beat egg yolks , sugar, butter until you get a creamy mixture. 2. Brew strong coffee and wet crackers (one by one) in the moderately warm coffee. let them cool off . Do not let CRACKERS stay too long in the coffee AS THEY WILL FALL APART. 3. Put a layer of crackers in a platter, in the form of a flower and spread with the creamy mixture. 4. Put another layer of crackers that you soaked in the coffee and, once again spread the creamy mixture. keep doing these layers of crackers. (you will keep making layers of crackers with spread cream in between the layers til you use all the crackers). top it with the shredded coconut. 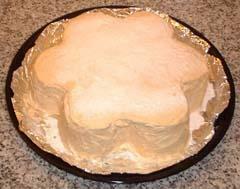 Note: if you wish to make a lowfat cake you may substitute the cream for the ready made "Cool whip " whipped cream. It's important to make sure that the coffee is not too hot as this will cause the cream to melt.